This Jet Air Hand Dryer is equipped with a DC brushless motor, if you want with carbon brush motor,we can talk. 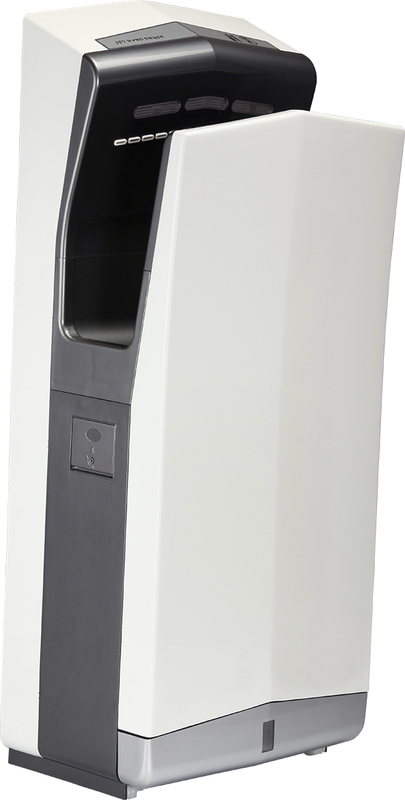 It is double Jet Hand Dryer,designed for 7 years of service at 1000 uses daily.It is stainless steel 304 body and painted with different colors. There is top and bottom sensors. A sensor located at the bottom of the unit detects fully inserted hands and initiates the airflow.A sensor located at the top can sense when hands are withdrawn,automatically stop. Hands do not touch any part of the Hand Dryer,making touch free design superbly hygienic. This hand dryer is certified by CE,RoHS,GS. This is a super high speed double jet hand dryer,dry hands for 5-7 seconds,with 20000 RPM motor. It will stop heating automatically when the ambient temperature is higher than 25ºC,and it will start heating automatically when the ambient temperature is less than 25ºC . The hand dryer is wall mounted design. Looking for ideal Double Jet Hand Dryer Manufacturer & supplier ? We have a wide selection at great prices to help you get creative. All the Hand Dryer Brushless Motor are quality guaranteed. We are China Origin Factory of CE Certificate Hand Dryer. If you have any question, please feel free to contact us.